Having to carry around a big and bulky wallet with lots of cards and cash in it is not only annoying, but looks terrible as it bulges out your pocket. Fortunately, there are unconventional slim wallets on the market that attempt to solve this problem. Distil Union’s Wally Bifold leather wallet is one of the best looking and inventive ones to hit the market as of late, and in my review, I’ll be seeing how practical it is and if there are any flaws. Dimensions (inches) 4.2" x 2.8" x 0.3"
Sticking with the increasingly popular minimalistic theme, the Wally Bifold leather wallet by Distil Union simplifies as much as possible without sacrificing capacity. Constructed of full grain cowhide leather from Argentina, it feels durable and smells good too. Its bifold design means that it’s folded at the centre like a traditional wallet but instead of having card pockets in the interior, it has an opening at the top of each side of the wallet where you can fit up to 6 cards on each side without bulking. 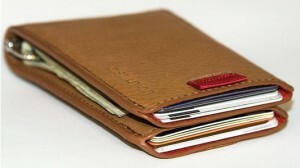 It shouldn’t be overloaded as the material will overstretch and will likely reduce the longevity of the wallet. On the flipside, having too little cards in the pockets means that it’ll feel a little loose. In total, it can hold up to 12 cards and 40 bills. When opened up, there’s a silver money clip inside is able to hold around 35-40 bills securely. It’s only designed to hold US dollar bills and putting other currencies inside (most notable Euro, UK and Australian bills), they will stick out around the edges. 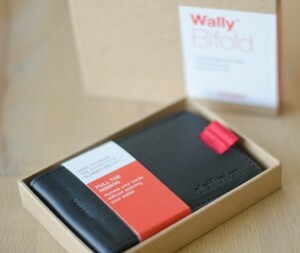 However, Distil Union has released a bigger version of the Wally Bifold to cater to the European market. 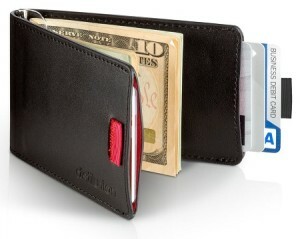 This slim leather wallet is missing one thing – A coin holder compartment. 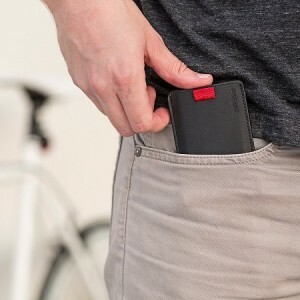 But then again, the inclusion of a coin compartment would only mean that the wallet will be slightly bulkier, so I presume that the designers at Distil Union sacrificed this for a slimmer wallet. The design and construction is pretty much top notch, but how well do the functions on the wallet perform? It’s an unconventional wallet with two quite unique functionalities – The pull tabs that ejects cards when they’re pulled upon, and the stainless steel money clip that holds the bills. Pull tabs are color coded and ejects cards evenly. Pull Tabs – Depending on which color wallet you choose (black or brown), the one pull tab will either be black or brown and the other will be red. This helps you to identify where you put your categorized cards (e.g. one side for personal and the other for business). When the cards are fully inside the holder compartments, the tabs will be short. To eject the cards, you have to pull the tab and your cards will be ejected all evenly at the same time. You then push the cards back in to shorten the tab again. This simple system works effectively but if there are a couple gripes that few users have mentioned is that the cards would be better served to eject in a stacked manner instead of evenly, in order to easily select which card you want. Also, over time, the tab may become stuck inside its own hole, making it very difficult to pull out. However, those issues are few and far between and overall, the tab pulling experience has been positive. 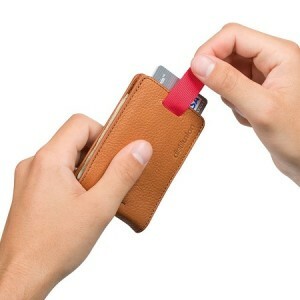 Money Clip – There is nothing overly special about the money clip used. It’s stainless steel and does what it’s supposed to do, hold bills. There is one particular highlight of this clip, which is the fact that it can be tightened according to how many bills you normally carry with you. This is just a simple process of lifting up the clip and turning it clockwise, which there will then be a click sound, and you have to continue to rotate it until it meets the level of tightness you require. It’s a pretty neat feature that is definitely handy. While the Distil Union Wally Bifold leather wallet is one of the best slim wallets I’ve seen, it does come in at quite an expensive price point of $60 (currently). However, the price is justified if you value innovation and practicality which of course, adds value onto the product. If you won’t be making the most of its space in the wallet, then you’re probably better off getting something that’s a bit lower priced and smaller. Though if 12 cards and 40 bills is roughly around the neighborhood of what you’d usually carry, then this wallet is ideal for your needs.